With the MeToo movement elevating sexual harassment in the public consciousness emboldened voices demanding gender equality in architecture are becoming impossible to ignore. We speak to several siren voices to establish the extent of the problem and ask what can be done to achieve a genuinely level playing field. Successive attempts to modernise the architectural profession have been met with indifference at best and active resistance at worst but with the RIAS itself in the throes of change progress might finally be on the cards. One of the loudest voices championing change is Collective director Jude Barber, a founding member of campaign group A New Chapter. Explaining her motivations Barber said: “As a feminist I believe in equality for men and women. 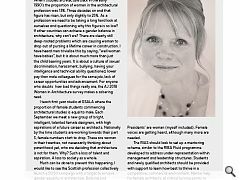 We don’t yet have a healthy gender balance, or a level playing field for women in architecture, which is why a degree of campaigning and activism is still required. 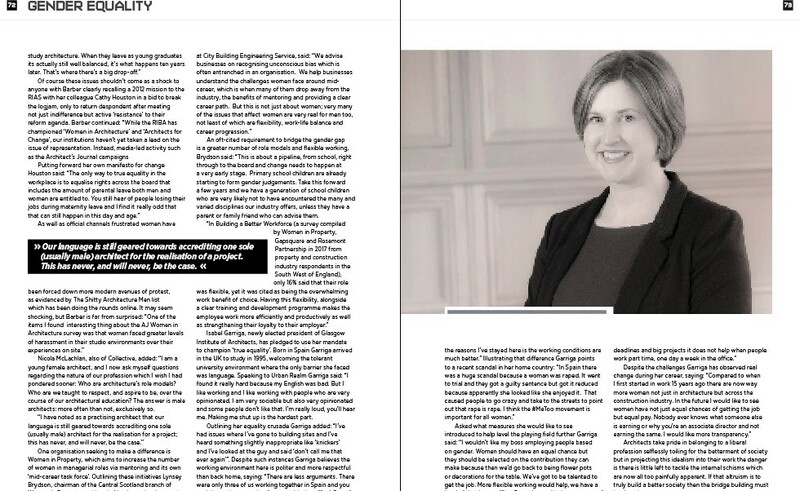 The reason I’ve become more vocal in this field is because when I looked out over the parapet I was struck by the pervasive sexist, at times misogynist, behaviour within the industry at large. Women have been swimming against the tide in many areas of their professional life for too long. 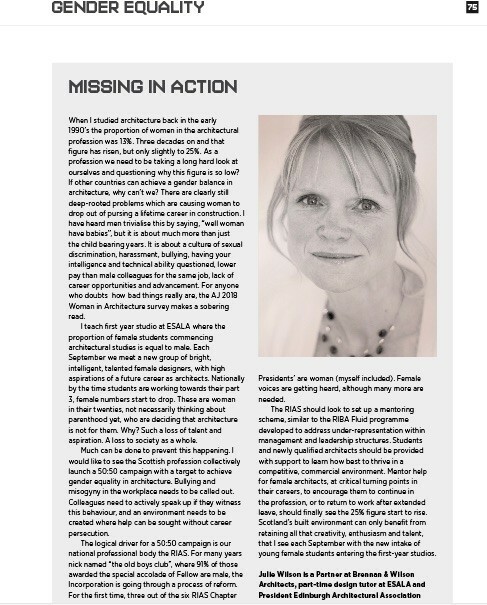 Of course these issues shouldn’t come as a shock to anyone with Barber clearly recalling a 2012 mission to the RIAS with her colleague Cathy Houston in a bid to break the logjam, only to return despondent after meeting not just indifference but active ‘resistance’ to their reform agenda. 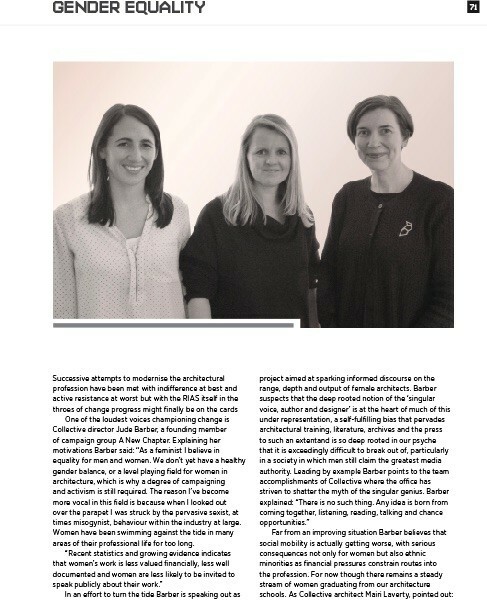 Barber continued: “While the RIBA has championed ‘Women in Architecture’ and ‘Architects for Change’, our institutions haven’t yet taken a lead on the issue of representation. 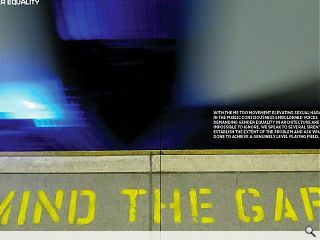 Instead, media-led activity such as the Architect’s Journal campaigns. 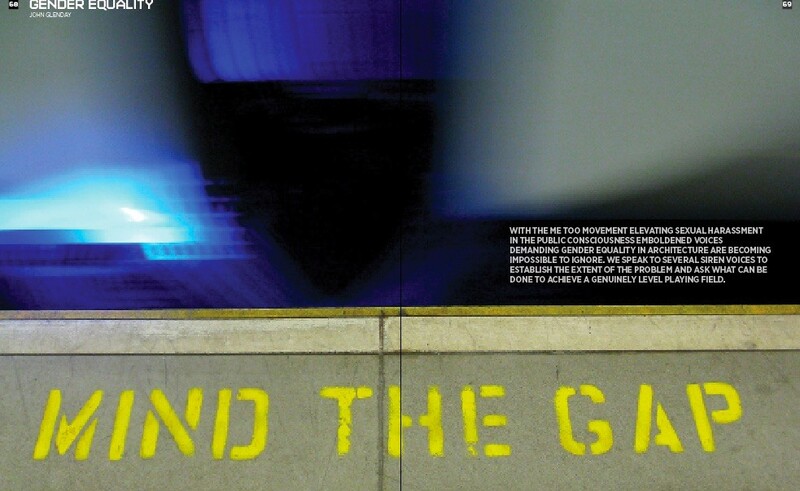 An oft-cited requirement to bridge the gender gap is a greater number of role models and flexible working, Brydson said: “This is about a pipeline, from school, right through to the board and change needs to happen at a very early stage. Primary school children are already starting to form gender judgements. Take this forward a few years and we have a generation of school children who are very likely not to have encountered the many and varied disciplines our industry offers, unless they have a parent or family friend who can advise them. Isabel Garriga, newly elected president of Glasgow Institute of Architects, has pledged to use her mandate to champion ‘true equality’. Born in Spain Garriga arrived in the UK to study in 1995, welcoming the tolerant university environment where the only barrier she faced was language. Speaking to Urban Realm Garriga said: “I found it really hard because my English was bad. But I like working and I like working with people who are very opinionated. I am very sociable but also very opinionated and some people don’t like that. I’m really loud, you’ll hear me. Making me shut up is the hardest part. Architects take pride in belonging to a liberal profession selflessly toiling for the betterment of society but in projecting this idealism into their work the danger is there is little left to tackle the internal schisms which are now all too painfully apparent. If that altruism is to truly build a better society then the bridge building must begin at home. When I studied architecture back in the early 1990’s the proportion of women in the architectural profession was 13%. Three decades on and that figure has risen, but only slightly to 25%. As a profession we need to be taking a long hard look at ourselves and questioning why this figure is so low? If other countries can achieve a gender balance in architecture, why can’t we? There are clearly still deep-rooted problems which are causing woman to drop out of pursing a lifetime career in construction. I have heard men trivialise this by saying, “well woman have babies”, but it is about much more than just the child bearing years. It is about a culture of sexual discrimination, harassment, bullying, having your intelligence and technical ability questioned, lower pay than male colleagues for the same job, lack of career opportunities and advancement. For anyone who doubts how bad things really are, the AJ 2018 Woman in Architecture survey makes a sobering read. I teach first year studio at ESALA where the proportion of female students commencing architectural studies is equal to male. Each September we meet a new group of bright, intelligent, talented female designers, with high aspirations of a future career as architects. Nationally by the time students are working towards their part 3, female numbers start to drop. These are woman in their twenties, not necessarily thinking about parenthood yet, who are deciding that architecture is not for them. Why? Such a loss of talent and aspiration. A loss to society as a whole. Much can be done to prevent this happening. 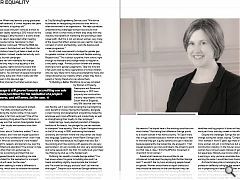 I would like to see the Scottish profession collectively launch a 50:50 campaign with a target to achieve gender equality in architecture. Bullying and misogyny in the workplace needs to be called out. Colleagues need to actively speak up if they witness this behaviour, and an environment needs to be created where help can be sought without career persecution. The logical driver for a 50:50 campaign is our national professional body the RIAS. For many years nick named “the old boys club”, where 91% of those awarded the special accolade of Fellow are male, the Incorporation is going through a process of reform. For the first time, three out of the six RIAS Chapter Presidents’ are woman (myself included). Female voices are getting heard, although many more are needed. The RIAS should look to set up a mentoring scheme, similar to the RIBA Fluid programme developed to address under-representation within management and leadership structures. Students and newly qualified architects should be provided with support to learn how best to thrive in a competitive, commercial environment. 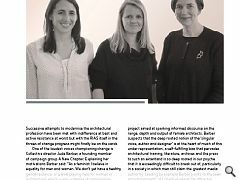 Mentor help for female architects, at critical turning points in their careers, to encourage them to continue in the profession, or to return to work after extended leave, should finally see the 25% figure start to rise. Scotland’s built environment can only benefit from retaining all that creativity, enthusiasm and talent, that I see each September with the new intake of young female students entering the first-year studios.